The San Diego Community Working Group on Short-term Vacation Rentals (STVRs), made up of local civic and community groups, issued a warning today for city residents to use caution if approached to sign a petition to overturn the short-term rental ordinance recently passed by the San Diego City Council. SAN DIEGO (8/16/18) – The San Diego Community Working Group on Short-term Vacation Rentals (STVRs), made up of local civic and community groups, issued a warning today for city residents to use caution if approached to sign a petition to overturn the short-term rental ordinance recently passed by the San Diego City Council. The Community Working Group has confirmed that Airbnb has hired PCI Consultants, a controversial petition firm based in Los Angeles, who has 130 paid and mostly out-of-town petition recruiters. They are working throughout the City of San Diego to recruit the 35,000 signatures required to put a repeal of the STR ordinance up for a referendum vote. It has also been confirmed that these signature gathers are resorting to false marketing to convince San Diego residents to sign the petition to overturn the recently passed ordinance that would allow home sharing and short-term rentals of a person’s primary residence, while protecting the city’s neighborhoods and housing from the negative impacts of unchecked short-term rentals. According to a Los Angeles Times article from earlier this year, PCI is mixed up in a current criminal investigation in Newport Beach involving potential false or forged petition signatures and was forced to “produce documents related to a petition signature gathering as the city conducts a probe parallel with a criminal investigation by the Orange County district attorney’s office.” In a 2011 petition drive in San Francisco, PCI’s signature gatherers were caught on tape lying to residents to get them to sign a petition. In 2016, PCI made $9 million collecting signatures for petition efforts. Ann Kerr Bache, president of the La Jolla Town Council and Head of the San Diego Community Working Group on STVR’s which supports the ordinance, said petition signature gatherers are telling residents that the ordinance will take away their right to share their home, which is blatantly false. Since the signature gatherers are paid per signature, their incentives are to tell people whatever it takes to get them to sign the petition. Chris Brewster, who served as a San Diego lifeguard chief for 13 years and is a member of the San Diego Community Working Group, says he encourages city residents not to sign the petition drive because the rapid rise of commercial Airbnb investors gobbling up homes in San Diego is ruining the fabric of communities, as well as taking away housing options and raising housing costs for the city’s vital workforce, including emergency responders, teachers and healthcare workers. Bache points out that any resident who was duped into signing the petition and wants their name removed can write a letter to the San Diego City Clerk to have their signature revoked. The San Diego Community Short-Term Vacation (STVR) Rental Working Group, is an umbrella organization that includes the San Diego Coalition of Town Councils (Clairemont, La Jolla, Mission Beach, Ocean Beach, among others), Neighborhoods for Residents, University City Community Association and Pacific Beach Planning Group, and has received input from residents who have seen their neighborhoods torn apart by short-term rentals. Bache noted that the Working Group presented a Set of Recommendation for STVR Regulations to the Mayor and City Council based on a few key principles: Fund; Permit; Monitor; Enforce; Penalize and Revoke Permits, if appropriate. Give Neighbors tools to insure short term renters abide by Good Neighbor Policies. 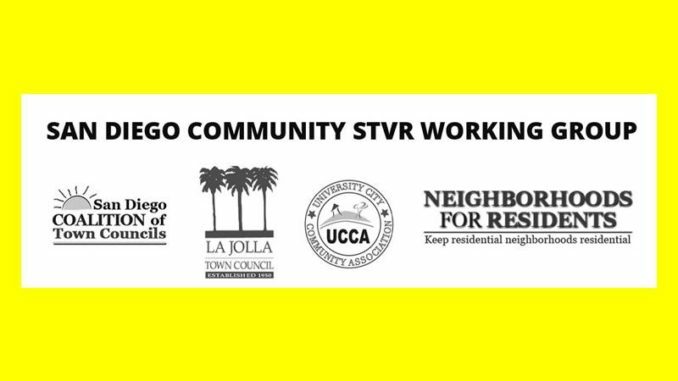 The Working Group believes that after years of public hearings and false starts, the STVR Ordinances that have emerged support Home Sharing while maintaining San Diego neighborhood quality of life for residents. All short-term rentals are and always have been illegal in San Diego. The City Council vote on July 16, 2018, made primary residence, whole-home and room rentals LEGAL for the first time starting next July 2019. The City Council vote expanded the use of a San Diegan’s primary residence/home to allow short term rentals for up to 180 days a year. Nothing was taken away or reduced. Remember, our City Council did not ban AirBnB; our City Council did not make AirBnbs illegal; our City Council did not take away anyone’s property rights. Our City Council made short-term rentals legal as of July 2019.